Happy October 1st! Autumn is hands-down the best season of the year. Time for spooky, paranormal, and otherwise haunting reads! My short story “The Resurrectionist’s Kiss” is featured in an anthology that is now available in print as well as e-book format. 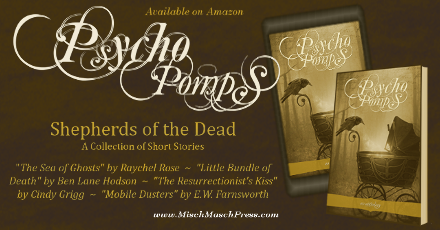 The anthology also features stories by Ben Lane Hodson (Author), E. W. Farnsworth (Author), Raychel Rose (Author). So if you are looking for a way to check out our work while celebrating autmumn and Halloween, this would be a good way to do that! Author Raychel Rose put together this awesome book trailer. Enjoy!